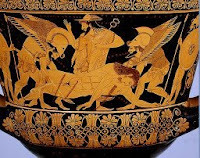 The Sarpedon krater once displayed in New York's Metropolitan Museum of Art has gone on display in the Villa Giulia, Rome ("Una casa a Villa Giulia per il vaso d'Eufronio; da oggi al Museo Romano insieme con tesori restituti dagli USA", ANSA May 7, 2009). The exhibition containing the pot was opened by the Italian under-secretary Francesco Giro and by Annamaria Moretti representing the archaeological service of Lazio. The press release suggests that the pieces have one thing in common: they had been removed from tombs in Italy before passing onto the antiquities market. do you have a link to the ansa article? I can't seem to find it.